Research shows how energy targets can be achieved. At first glance, the sleek and sculptural 21-story Astor Place tower in New York City appears out of place in the heart of the bohemian East Village. But true to the spirit of the neighborhood, Astor Place is challenging convention and advancing the ideals of energy conservation and sustainability. These advancements were accomplished through a collaboration among a water technology company, building manager Related Management Co. and the Sustainable Engineering Lab at Columbia University, to test assumptions of energy efficiency in a retrofit of the building’s hydronic heating, ventilation and air conditioning (HVAC) system, later documented in a doctoral dissertation. The Astor Place Energy Improvement Project consisted of three primary steps: conducting an initial energy assessment of the hydronic system, updating the system with technologically advanced pumps and controls and adjusting the system in real time to evaluate the effects of the HVAC modifications. The impact of energy efficiency improvements is often difficult to demonstrate at the individual system level because buildings typically get billed for energy use at the building level. According to Luke Falk, assistant vice president at Related and an adjunct professor at Columbia University, the partnership among the water technology company, building manager and Columbia University allowed stakeholders to gain a granular understanding of exactly how much energy they would save by implementing a complex HVAC enhancement. The key finding from the testing was that right-sized pumps paired with variable frequency drives (VFDs) powering the chilled water portion of a hydraulically balanced system can deliver a 95 percent reduction in pumping energy, far exceeding the team’s expectations. 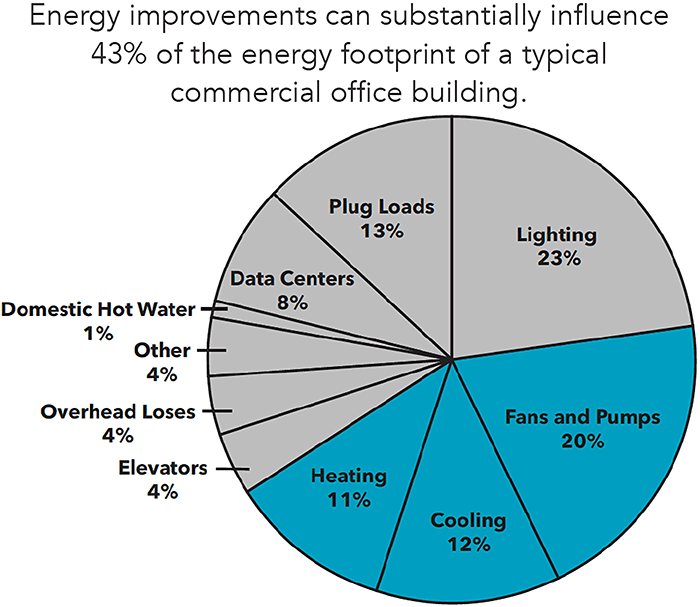 Coupled with the findings in an American Society of Heating, Refrigerating and Air Conditioning Engineers (ASHRAE) Journal article that concluded energy improvements in the HVAC system could substantially influence 43 percent of a building’s total energy, this has a dramatic impact on the overall building energy footprint (see Image 1). Using data collected during the initial energy assessment, Columbia University researchers and water technology company engineers jointly reviewed the data. Researchers then calculated potential energy savings and tracked key system parameters following the renovation of the chilled and hot water systems, developing a mathematical model from the data. This prescriptive pathway to assess performance offers relevant technical data that, before now, has been extrapolated solely from laboratory test results or obtained through time-consuming proprietary energy assessments. Image 2. Original system schematic. Astor Place was developed by Related Companies and completed in 2005. It includes 39 residential units with commercial space on the building’s first and second floors. The HVAC system uses hydronic space heating through boilers and cooling with central absorption chillers. Fan-coil units provide HVAC to residential floors; HVAC in the common and commercial spaces employs air-handling units. Only the central plant equipment and air handling equipment in the commercial and common spaces were included in the retrofit and subsequent evaluation. The approach to the ChW and hot water (HW) systems was nearly identical, though monitoring was more comprehensive on the ChW systems, the details of which are outlined here. Image 3. Post-retrofit system schematic. On the cooling side, the original 30-horsepower (hp) condenser water pumps were replaced with lower horsepower but more technologically advanced pumps. The new pumps immediately delivered savings in electricity use—from 25.3 kilowatts (kW) to 18.0 kW. Other modifications included new piping to create primary/secondary chilled water loops out of the original primary only system and the addition of 7.5-hp primary pumps. Constant primary chilled water flow optimizes chiller performance. Decoupling the loops in the original one-loop system allowed for the installation of variable flow technologies on the secondary loop. New 15-hp pumps replaced the original 20-hp distribution pumps and were outfitted with VFDs. The head losses were lower than expected, so the team was able to use smaller replacement pumps. This created more energy savings potential with the VFDs than on the larger pumps. Savings from dynamic adjustment using VFDs offset additional electricity required to operate the new primary pumps. In providing their expertise, along with the pumps, drives and monitoring equipment for the project, the water technology company engineers obtained specific real-time data on pump and system performance.